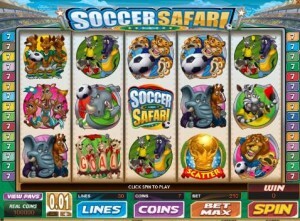 If you love soccer and if you are into online slots that are more than just a simple 2D reel-turner with no features, then “Soccer Safari” is perfect for you. This Microgaming slot is more a game than a slot machine. 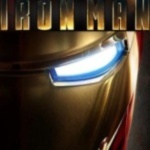 It has great animations and little video clips and never gets boring. Click here to play Soccer Safari now, or keep reading to find out more. Soccer Safari’s theme is soccer, more specifically the World Cup of Soccer. The symbols depict animals that play for different teams and in different positions. There is the lion goalkeeper, the Zebra referee, and then there is even a commentator duo, consisting of an elephant and a giraffe. 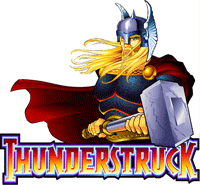 In general, the graphics and animations are fun and positive. There are 5 reels in Soccer Safari. The first scatter symbol is the World Cup trophy: if it shows up 3 times, the “Goal Bonus Round” starts. The second scatter symbol is the referee. Furthermore, the “Soccer Safari” symbol is the wild card that replaces all symbol except the World Cup trophy and the referee. 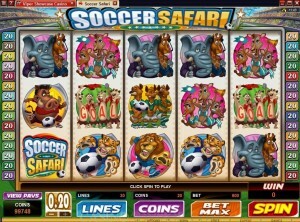 There are up to 30 paylines in Soccer Safari, each one can be selected individually. You can also change the amount you bet for every line. The best thing about Soccer Safari is probably the “Goal Bonus Round”. This is not just a simple free games round. It is almost like a mini-game inside the slot. It is triggered by getting 3 World Cup trophies. Then the player has to select a team (one of 3), a player (one of 5 animals) and then a corner of the goal, in which the player should kick the penalty. Then the player wins cash prizes that can be also be multiplied (by up to 5 times). If the referee appears on the first and fifth reel, you get 5 free “wild” spins! 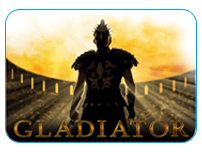 It also possible to win even more free spins during these free games. There is no progressive jackpot to win in “Soccer Safari” and the payout percentages are the same as for all Microgaming slots.